Ed: This article is an excerpt from the teleseminar I recorded with Laura Cross for her Expert-Entrepreneur program. 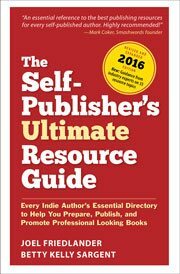 This program has a great lineup of experts Laura chose to help educate authors about the publishing process. In this excerpt, we talk about how self-publishers can choose fonts for books. See the link at the end of the article to hear the complete recording. Laura: I’m sure our listeners would love to learn more about typography. You mentioned that earlier. How does the typography you select affect the book? Joel: Books are typographic, they’re almost entirely made up of type and typography. The font you pick for the body of the text is going to have a big effect on how readable the book is. Some typefaces are more readable than others. I would encourage self-publishers to stay with tried and proven typefaces that we’ve been using for many years. They’re easy to find and easy to use. They will give you a much better result than a lot of fonts that might look nice for a headline, but would give you a headache if you tried to read a 300 page book typeset in it. People won’t be bothered trying to read a book that’s basically unreadable. Laura: So how many fonts should you be using in your book? Can you use more than one or should you just stick with one? Joel: Most books are typeset with two fonts. The reason is that we usually have some kind of display material. For instance, we have “Chapter 1” and the name of the chapter, and we use more decorative typefaces for display purposes. After all, a book is hundreds of pages of gray columns of type. It’s nice to give the reader a break once in a while, and the chapter openings or part openings are a good place to do that. Usually we use a contrasting typeface and frequently we’ll use a san serif typeface for the display or something a little bolder for the chapter titles. It’s a lot of fun finding font combinations that work well together to create the total appearance of the book. Laura: And that’s important to have complimentary fonts then? Joel: I think it makes a big difference. For the larger type, like your chapter titles particularly. If you’ve got a book of old Western stories, you probably don’t want to typeset that in Helvetica (or Arial), which is a very modern Swiss-design typeface. You might be looking for something that would allude to the period or the genre that you’re writing about so that’s something to look for when thinking about what display type to use. Laura: The fonts then should align with the content that you’re presenting? Joel: Yes, and mostly what you’ll find is that they are allusions. You can’t get too literal, but if you have a sci-fi book you’re doing, you don’t want something that looks like it came off the Ponderosa Ranch or might be used for “Hello Kitty” ads. You want something that will allude to the subject of your book, sure. Laura: Our listeners are entrepreneurs who are writing non-fiction books, mostly business, self-help, how-to. Do you have some favorite fonts for those types of self-publishers? Joel: I do and I’ve put together a list of some of my favorite fonts for the text part of your book. Probably the one that I will recommend most often would be Garamond. I use the Adobe Garamond version of Garamond. It’s one of the most readable book typefaces I know. It sets beautifully and it could be used for a large variety of different kinds of books. I also like two typefaces with similar names. One is called Adobe Jenson. It’s a model is of a very old typeface from the 15th century. The other is Janson text. They are both very usable typefaces. I also use Adobe Caslon quite a bit and it’s appropriate for a wide variety of books. I find I’ve been using a typeface lately that some of you non-fiction authors might like. It’s a font called Chaparral, which is a little bit more modern. It comes in a variety of weights, also from Adobe. It gives a little bit more modern look to the page and some of your listeners will probably like that one quite a bit. Laura: And you can just get these fonts from going to Adobe’s wensite and ordering them? How does that work? Joel: Every one of these fonts is available from Adobe and you can go to the Adobe Fonts website. They have an enormous type library. There are many other fine type foundries on the web now. There’s Emigre fonts and monotype fonts and many others. Search around and you’ll find variations of some of these same fonts I’ve mentioned. Many foundries will have a version of Garamond, for instance. There are many versions of these classic typefaces, and you can compare them to see which ones you like the best. The typefaces I’ve mentioned are all available from Adobe. If you’d like to listen to the complete one-hour teleseminar, head on over to the Design to Sell recording at Expert-Entrepreneur. “Laura: Do you have some favorite fonts for self-publishers? Did I understand right, there is a list of your favorite fonts in Laura’s book? No, Laura’s book doesn’t deal with fonts. However, check out this article: 5 Favorite Fonts for Interior Book Design. I found this article while searching for good fonts for print, and was led to Adobe’s great font collection as a result. Based on Laura’s comments I was thinking of going for the Adobe Garamond Pro, but it’s still not clear to me that if I purchase it for my own use (i.e. paying USD 35.00) the license will allow me to print and sell my own book using that typeface. Are there any hidden fees or something? I agree about using complimentary fonts for main heads and body. I have also noticed that some fonts need more leading than others to be truly legible. IMO, the smaller the x height the more leading necessary. My experience is the same, Leslie. In fact, I find the easiest way to increase readability is by careful increase in leading. Thanks for your expertise. Boy, I love your posts on typeface, Joel. I was a typesetter for years and had to know 200 fonts by sight. So many of them are so close to identical, but the three you cited here—Adobe Jenson, Janson text, and Chaparral—are really lovely and quite distinct from each other. And, yeah, Garamond’s a classic. I like Book Antigua and Bookman Old Style, too. I even had a Century Schoolbook period, back in the mid-’90s. Thanks Victoria. I think I could write about type every day! Just did a book in Century Old Style, hadn’t used it in maybe 10 years. You’re absolutely right about the typefaces having to complement the subject and mood of the book, and that display type has to complement text type. I recently discovered another issue to be considered. A few months ago I purchased Adobe Garamond Pro to add to the free fonts that come with Microsoft Word. AGP is nicer than the free Garamond and I like it a lot. I redid one book in AGP that had been composed with Calisto, and liked the way the PDF looked on my computer screen. Unfortunately, the printed proof disappointed me. The pages were cream, and the delicate strokes in the AGP do not show up well on the dark pages. I’m thinking of changing from cream to white. So, in addition to the book’s subject and mood, self-publishers who design their own book interiors should also consider the page color and type size when choosing typefaces. Beauty is desirable, but readability is critical. I find that interesting Michael, since I’ve used Adobe Garamond for many years on a variety of books and on different paper stocks without any problem like the one you described. Of course it may be a matter of personal preference, and there certainly are typefaces that are more robust that you could experiment with. Thanks for raising an interesting point.